Purple White Lightning Indica Shatter: Bred by British Columbia Seed Company, White Lightning is an indica-dominant hybrid that combines White Widow and Northern Lights #5. Though counterbalanced by White Widow’s hybrid genetics, White Lightning induces a deep indica calm that relieves pain, nausea, and anxiety. Dusted in a heavy coat of sugary trichome crystals, White Lightning has a sweet, fruity aroma with floral, skunky undertones. Among the most common conditions treated with White Lightning are multiple sclerosis, insomnia, anorexia, Parkinson’s, and the side effects of chemotherapy. White Lightning flowers in 8 weeks, and grows best in hydroponic systems and sea of green environments. 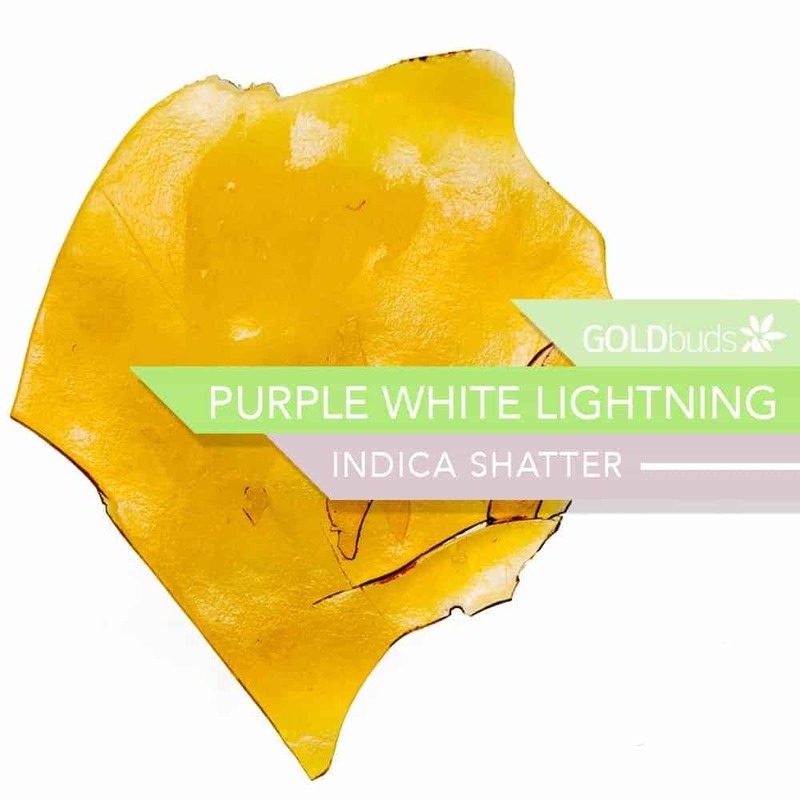 4 reviews for "Goldbuds – Purple White Lightning – Hybrid Shatter"
I was hesitant to try this product. I ended up ordering 4 different kinds. I tried this one and I was surprised. Smooth and effective. It made me try the other 3 before I was ready. lol. I am very happy that I ordered them. I will stick to the goldbuds shatter for sure. Job well done guys!! Just got my order and glad I tried it it’s smooth and has a good high. Thanks goldbuds I already got an order for more sent out! Thanks again too for the fast delivery and excellent service the 5 stars goes to you and your product!